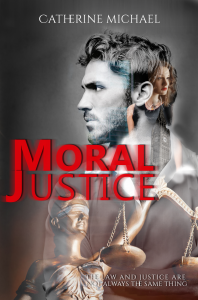 Moral Justice is the first book in a trilogy based on criminal defence work. Moral Justice explores the moral dilemma a Manchester barrister faces when he realises the law may not deliver justice. Three young Manchester barristers, Dominic, Phil and Ged have their fair share of ups and downs but, in the main, they love the work they do. They entered the profession because they have a passion for justice, an innate sense of what is right and wrong. A life-changing event challenges the belief that, for at least one of them, legal justice is not working. It leads one to ask himself, is it ever okay to mete out moral justice when legal justice is not working? The inspiration for this book came when I was a criminal defence lawyer in Manchester. After a particularly gruelling day, I and some colleagues went to the local bar to drink away the angst. A colleague uttered a throwaway comment and it stuck in my head. I knew then that I had to write it. The characters are an amalgamation of different people I have met throughout my life. I didn't want to base the characters on actual lawyers that I know so I made sure that characters, descriptions, mannerisms could not be traced back to any of my former colleagues, who I'm still in touch with! "What’s that got to do with you? They realise you didn't defend him?" Ged carried on, "They know that, but they’ve got this tendency to lump ‘types’ together. You know? Defence lawyers are all the same. You know? Muslims are all the same." said Ged. In the blink of an eye, Ged went from being indignant to despondent. “I’ve stopped talking to them about my work now, especially the ‘successes’, it’s not worth the condemnatory silence.” He lifted his drink and lost his thoughts in the froth in the glass. Phil rotated his cigarette lighter between his fingers and pondered Ged’s words. As he leant forward, the question penetrated Ged’s brain; elbow on knee, chin in palm he thought hard, his gaze extending beyond the wall of the bar. Ged stared at Phil, wide-eyed and slack-jawed. They looked at each other and smiled, sheepishly. Both felt a little exhilarated and, a tad ashamed of their make-believe actions.